As children we we’re drawn to it. We dig in it at the beach or the sandbox in our backyard. Some like the feel of it between their toes as they go for romantic walks along the beach or while lying out and soaking up some sun. Watching it flow through an hourglass mesmerizes us. It is as old as the earth and yet sand still entertains us. All of the above applies to me when it comes to sand. However, as I’ve gotten older and spent more and more time on the shores of The Bay of Fundy and walking along the beaches of local lakes and rivers, I’ve developed a new appreciation for sand. 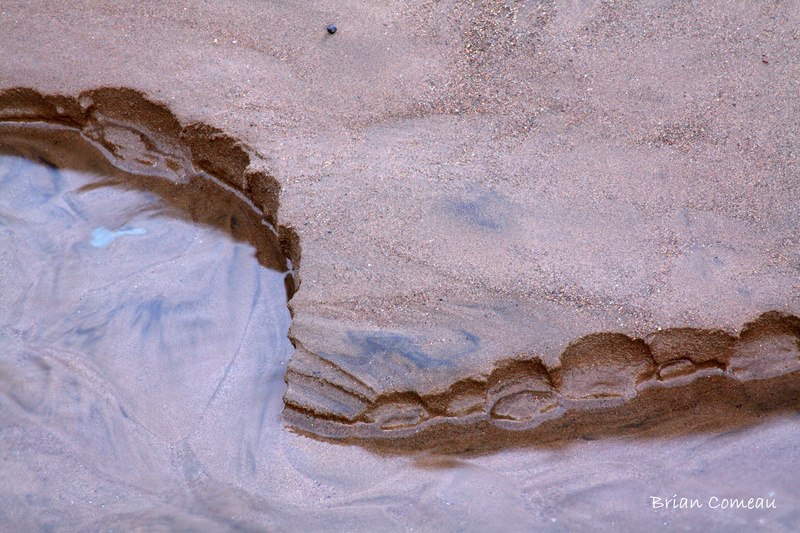 The colors, textures, and shapes that are carved into the sand around the waters next to my home have been the subject for hundreds of my photographs. 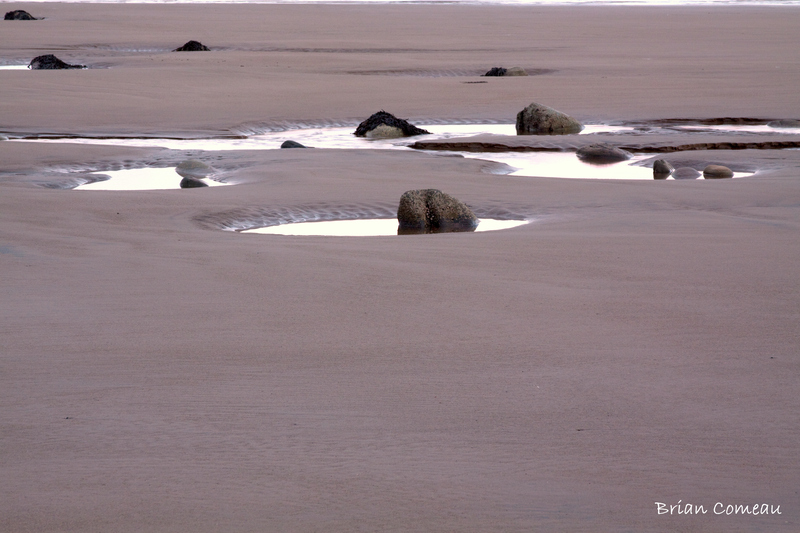 It is something so simple but yet with each new tide an image is created and waits to be recorded by my camera. Sandbar seems appropriate. It even looks like chocolate. When I feel like I’m getting stale with my imagination and my photography in general, I look to the shoreline for new ideas and motivation. 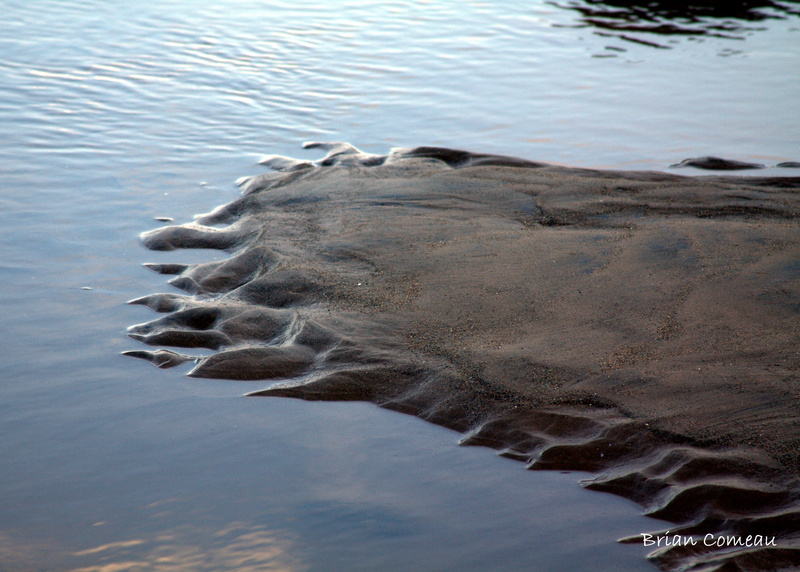 The patterns and textures in the sand created by the power of the ocean offer me ample photographic opportunities. I can visit the beach as often as I like and I’ll never run out possibilities. One visit can bring smooth flat surfaces almost glass and the next day when I visit again and the shores are rippling and almost ribcage like. I found this sandbar like this. It looks like someone used an ice cream scoop on it. Nature is amazing. The other aspect that marvels me about the shores in my area are the colors. People talk about white sandy beach when they go on vacation but here in the Maritimes I can walk on beaches that are white, red, grey and even black. As I’ve traveled around The Bay of Fundy I’m still amazed when I visit a new cove or bay and find new colors, textures and types of rock. Sometimes within a five-minute drive there will be two beaches, yet they look so different and still part of the same body of water. The colors and hues seem limitless. Craters on the Moon. This is what I imagine it would look like…. Sometime a walk to the beach is just for an escape from the craziness of life. There is something about waves, the sand and the smell of the beach that soothes the soul. The problems from the day disappear and are replaced by the expanse and awesomeness and power of the ocean. It seems like it never gets old with each visit. I’m left feeling an enormous sense of awe at God’s magnificence. The details of His creation and art are beyond the scope of what I would ever be able to capture with a camera. Excellent photos, Brian. Beach sand is a favourite subject for me too, so it’s nice to read about someone else’s passion for it. Thank you Frank. If you ever get out this way let me know and I’ll show you a few of my favorite beaches. This was a beautiful post, Brian, both in words and in images. Nature is endless in its beauty, even in its simplicity.